A children’s choir is circled around me, singing. Individual voices become clear and then fade away again as I turn from side to side, listening as the notes mix and blend together before disappearing into the vaulted ceiling above our heads. The choir fades to black, reminding me of where I really am: a dark room in Palo Alto with a set of Oculus Rift goggles strapped to my head. What I just watched is akin to the most advanced home movie ever filmed. The children were not actually singing to me, but to a ball-like camera that films video and audio in 360 degrees. Jaunt, a Palo Alto startup that revealed itself today with news of $6.8 million in venture funding, intends to use its unique camera to prove that virtual reality is not just for gaming. The company is developing an assortment of software and hardware that will allow Hollywood — and potentially anyone — to shoot 3D film and audio and use existing software like Final Cut Pro to edit it. 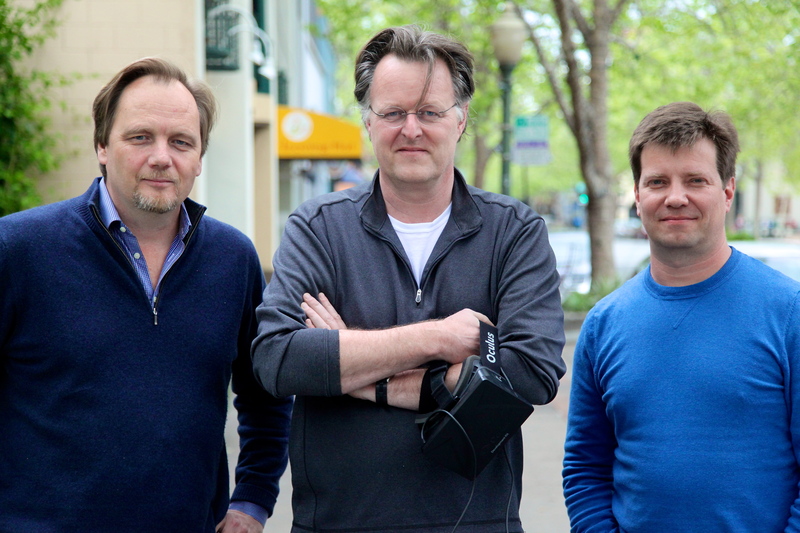 Jaunt CEO Jens Christensen, CTO Arthur van Hoff and vice president of engineering Tom Annau. Photo by Signe Brewster. Jaunt was founded one year ago by Jens Christensen, Arthur van Hoff and Tom Annau, who hail from Redpoint Ventures, Flipboard and Google, respectively. The $6.8 million comes from Redpoint Ventures, Peter Gotcher, Blake Krikorian, SV Angel and British Sky Broadcasting. The five or so clips I saw during a demo at Jaunt’s office were all shot with existing equipment, and the results were convincing. Jaunt builds a 3D view of the world by creating two spherical movies and feeding one into each eye. But it really tricks your brain with audio, which shifts exactly how it would in real life. The demo room in Jaunt’s Palo Alto office. Photo by Signe Brewster. 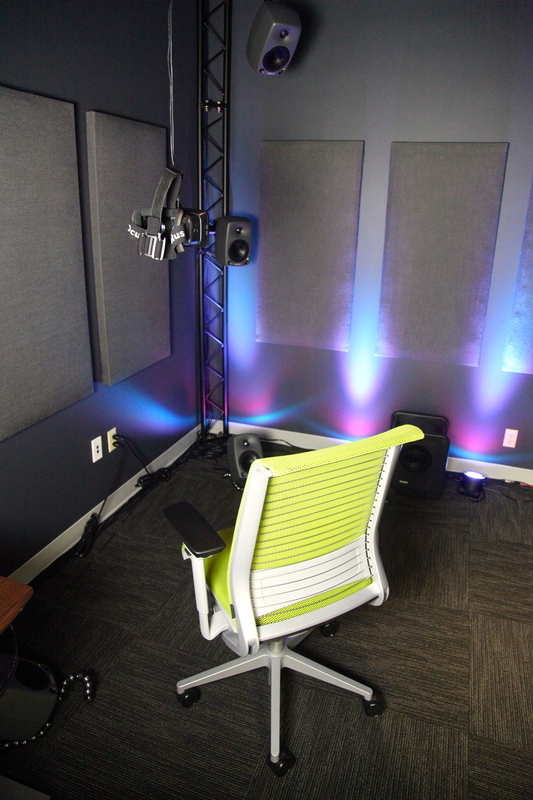 During the demo, I experienced Jaunt with surround-sound speakers and through headphones. Both responded as I turned my head, altering sounds to match whatever new orientation I was in. So as I watched a BMX biker roll up and down ramps in a skate park, the sound of his wheels scraping the concrete really sounded like it was passing in front of and behind me. 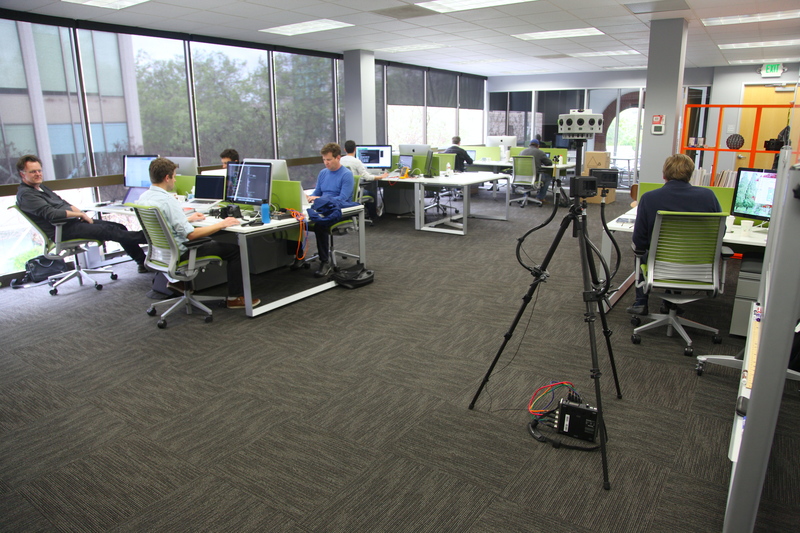 The Jaunt system is not meant to be specific to one virtual reality device, though the bulk of the work the team has done so far has been for Oculus Rift. They have adopted the film shot by their camera to play on an iPad minus the surround-sound effects, and plan to pursue other virtual reality platforms in the future. Its creators see it having purposes far beyond watching feature-length films or home movies. Imagine escaping from a cold winter by strapping on Oculus Rift and pretending you are on the beach, for example. 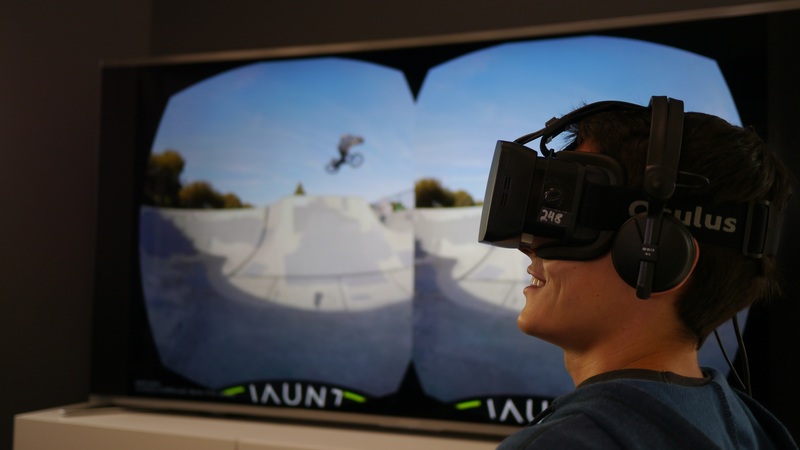 An view of the two images displayed when you look through an Oculus Rift headset paired with Jaunt. Photo courtesy of Jaunt. After the children’s choir faded from my vision, I find myself in the hull of a crabbing boat being attacked by mutant sea creatures. Hallways extend in every direction around me. I don’t know where to look as shadowy tentacles and panicking crew members go in and out of view in the corners of my vision. Cue a giant crab creature behind me. I whip around, only to find it most definitely has Erich in a death grip. The woman’s pleading voice has gotten to me and I desperately want to help Erich (apparently I’m brave when it comes to mutant sea creatures), but I can’t. I don’t have any control over what I’m doing; just where I am looking. Jaunt’s office in downtown Palo Alto. Photo by Signe Brewster. People have said again and again that the power of the Oculus Rift is that it makes you feel like you are really there. I’ve felt pulls of that in the few brief times I’ve tried it on. But as soon as Rift was paired with film of real people and surround sound, that feeling of being there finally clicked for me. I have no doubt that virtual reality will find huge applications in gaming, but it is also a very, very fitting platform for cinema. The crab attack actually took place on a real set for the upcoming sci-fi horror film “Harbinger Down.” The shot was meant to test Jaunt’s system, and is not a real scene in the movie, but it proved virtual reality has some major strengths over traditional movies. Horror movies are much more intense if you are responsible for looking around to find the next monster. And it really feels like you are in the scene, leading to a new level of intimacy with other characters. Of course, this also creates some interesting challenges for filming. The Jaunt camera films literally every angle except down, which means only the actors in a scene can be within sight of it while it is shooting. The director and rest of the crew need to hide out of sight. Jaunt is working on a totally new 360 degree camera, but has already shot footage on several prototypes. 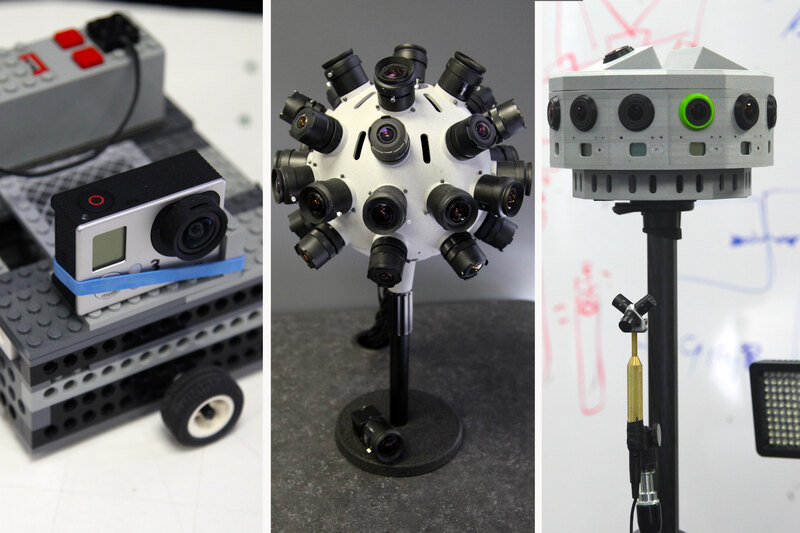 Its first prototype, pictured on the left, was built out of Legos and a GoPro camera that turned slowly in a circle. Photos by Signe Brewster. Jaunt is now working with partners in the entertainment industry to jumpstart creative projects that make use of the platform. Christensen said the team is focusing on creating content that is as high of quality as possible and, so far, has received some very positive reactions. He added that while the Jaunt camera’s initial price (which has not yet been released) might make it more suited to Hollywood, he would love to eventually see the entire system in the hands of consumers. I would too. Out of all the clips I watched, the video of the children’s choir was the one that stuck with me the most. I didn’t know any of those kids, and yet their performance still felt personal and powerful. Try capturing that on a camcorder. I know it’s hard to describe what the VR experience is like but I’m curious… Were you able to lean forwards and backwards and would the perspective shift? How about leaning left and right? Would the perspective shift then too? Or were you just able to turn your head 360? Yes, it responds to you leaning or tilting your head. It feels very natural. I guess it works by zooming the video. Just a sample of what’s yet to come when Oculus Rift eventually hits the market. Jaunt is developing the hardware/software required to shoot cinematic 3D movies. It is in prototype now. And it is very early days still even with the Oculus Rift VR head set. But now is the time for companies like Jaunt to stake their claim, and start up before the VR land rush occurs. Great article on Jaunt, seems like they’ve got a lead on anyone else that’s going to be hard to close. Hopefully they can keep that competitive advantage while Oculus Rift slowly spins up to full speed.